The discussion article titled: Strengthening Global Efforts to Combat Organ Trafficking and Transplant Tourism: Implications of the 2018 Edition of the Declaration of Istanbul was first published in Transplantation Direct here. With open access permission, the article is republished below. To download a pdf copy click here. To download a copy of the 2018 Edition of the DoI, click here for English and here for Spanish. MADRID, July 1, 2018 – The first new edition of the Declaration of Istanbul on Organ Trafficking and Transplant Tourism, a seminal document that has helped to guide ethical practice in organ donation and transplantation around the world, was presented today at an international workshop in Madrid, Spain. The Declaration was originally published in 2008, following a summit convened by The Transplantation Society (TTS) and the International Society of Nephrology (ISN) in response to growing concerns about international trafficking in human organs. It established definitions of practices such as transplant tourism and organ trafficking, and principles to guide policy makers and health professionals working in organ donation and transplantation. Since 2008, more than 135 professional societies have formally endorsed the Declaration. The Declaration of Istanbul Custodian Group (DICG) is an international group of transplant professionals and scholars that works closely in collaboration with its parent organizations, TTS and the ISN, to encourage and support implementation of the Declaration’s principles around the world. In 2017 the DICG formed an international working group to draft a new edition of the Declaration, updating the definitions and principles in the light of clinical, legal, and social developments in the field throughout the last decade. In February this year, the DICG launched a public consultation inviting feedback on the draft updated to the Declaration. All DICG members, members of organizations that have endorsed the Declaration, and other interested stakeholders were invited to participate. More than 250 people from around the world participated in the working group and public consultation; approximately 65 submissions officially represented national or regional organizations. The response from the public consultation was overwhelmingly positive: participants welcomed the renewed commitment to combatting organ trafficking and transplant tourism, the updated and expanded definitions of key terms, and a clearer set of principles to guide policy and practice. The new edition of the Declaration incorporating feedback from the public consultation was presented today in Madrid, at a DICG workshop celebrating the 10th Anniversary of the Declaration, as part of the 27th International Congress of TTS. 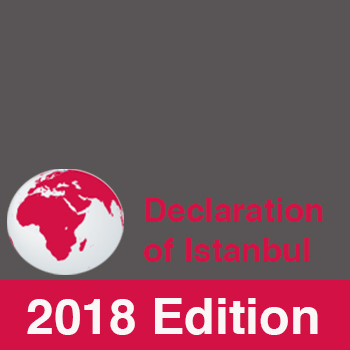 The new edition will be published on the Declaration of Istanbul website, with translations into several languages coming soon. In the coming weeks, a comprehensive Commentary Paper on the 2018 Edition will also be published. The Commentary Paper will explain the principles in more detail and provide suggestions for their practical application in response to questions and suggestions from participants in the public consultation. To download a copy of the 2018 Edition click here for English and here for Spanish. The present state of transplantation in theUnited States can be most easily summarized as “good news/bad news.” On the positive side, improvements in shortterm outcomes have translated into measurable improvement in long-term survival (1), new allocation schema have increased opportunities for disadvantaged populations (2), and the absolute number of transplants performed annually continues to increase (3), in part due to strategies that facilitate living donation. The bad news, of course, is that these improvements are dwarfed by the growth of those waiting in need of a transplant (4). Although efforts to increase deceased organ donation are important, it would take fundamental changes in deceased donor management or clinical practice to more substantially affect the “need gap” via deceased donation. Efforts to facilitate living donation, specifically by reducing any barriers to living donation, are much more likely to affect transplant rates, thereby increasing the opportunity for patients with ESKD to receive the most optimal and cost-effective therapy. To this end, the American Society of Transplantation helped draft and drive introduction of the Living Donor Protection Act (LDPA).